In an era of great technological advance, the question always arises – how good are these advances, conveniences and marvels of technology for us… in general? You know, our health… mental and physical. I, for one, am typing this blog entry on a Macbook Pro connected through a secure wireless network – and I know my router pretty well… I customized the settings – I have the power level at “medium” – most people are not aware that they can tweak their routers in a myriad of ways – and for me, setting the router output power to a level that works within your work space makes sense in a variety of ways; 1.) It is more secure if you keep your range within the confines of your home and 2.) It adds the minimum of wireless energy to existing orchestra or medley of wireless signals in your living space. And so you know: I do not believe for a second that 1 device or the output of a handful of devices is going to harm you in any quickly identifiable way – the scientific evidence is not really there. What I do question (actually I question a couple of different things about this topic area) is the immediate acceptance of any technology that is foisted upon us (or, ahem, introduced) without a sound fiscal or technical rationale for spending a small fortune on introducing the technology. And I know this is kind of late in the game but I heard recently that there have been some perfectly sound judicial decisions about the technology and some of the responses from some local media types is that the Tin foil hat wearers and those that suspect that their PIN Numbers or souls are being stolen by this technology need to relax or take a pill. Which, to me, is nothing more than cruel bullying – and are we not on that very subject of bullying a lot lately? My point is – I respect anyone (smart or not so much) that questions stuff, any stuff – and even if their claims are a little off the wall, there is no reason to insult anyone. So: More on where I am coming from. My actual area of expertise is electronics engineering technologist – and my main discipline is, guess what, telecommunications. So I know a little bit about wireless technology. So, let’s talk about wireless for a bit… and wireless radiation. There are two types of radiation in nature: Ionizing radiation and non-ionizing radiation. Examples of non-ionizing radiation include cell phones, routers, ham radios, walkie-talkies, radio and TV transmitters, hair dryers (yes, hair dryers) – virtually any electrical or electronic device that has “inductive” properties (has a motor), modern power supplies (like a wall wart for a laptop computer) – even computers themselves radiate a bit of energy on a broad range of frequencies. Examples of ionizing radiation include X-ray machines, ultraviolet light, gamma radiation and all that neat stuff that nuclear weapons and processes throw off. The thing about ionizing radiation that is bad is: It can (and does) alter your DNA, cause cancer and/or birth defects. It is that simple. No one questions this. When you think about it for a minute, modern medicine is the last 100 years worth of advances. It was not that long ago in history that we discovered antibiotics, antihistamines, remarkable drugs for all kinds of things – even treatments for cancer that were non-existent only a few years ago. And humans have been roaming the planet for thousands and thousands of years – so, point is: A lot of what we are doing today is pretty darn new. My bigger point: It was only a few years ago, that people would suggest that folks with Fibromyalgia were imagining their symptoms – was all in their heads. This condition is now accepted to be real. I personally know people that swear that they are effected, in some way, by the presence of high tension power lines (you know the ones, the 300kv transmission lines that cross many rural areas.) There is no physiological reason why anyone should be impacted by the presence of AC power lines near their home – that we currently know of. But who knows what we might discover in the future. We are, after all, bio-electrical creatures… so, who knows right? The level of energy you encounter from any device drops, in intensity, is at the inverse square of the distance – simply, at 2 feet away, the energy is 1/4 and at 4 feet away it is 1/16th etc. It drops off pretty quickly. 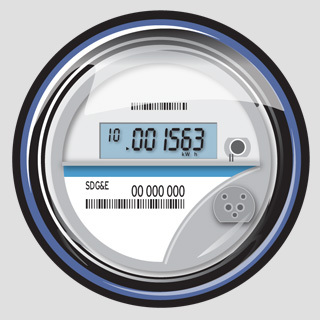 So: Are Smart meters harming anyone? Well. That depends. If one burps out a burst of wireless data every minute or so – more or less at the level of a cell phone and you have one in your home, chances are, it is competing with a bunch of other devices – and some of them are chattering even more frequently. And if you live in a condo or high rise and there are dozens or hundreds of units in your space, then there are hundreds of these device ejaculating bursts of 900+ Mhz energy almost continuously. Good or bad, we do not currently know. What I do know is that it is likely less healthy to stress out about it and raise your blood pressure about the possible effects of something that we do not completely understand. If the average person finds these technologies intolerable, then they should have the option of limiting their exposure – and for sure they should not be ridiculed in public or privately. I have been seeing a bit of this in the social media realm and it sickens me. The same person that would ridicule someone who objects to this technology or fears it or questions the wisdom of the investment is clearly the same kind of person who abhors the sight of a handicapped person, a child or adult with a learning disability or someone in a wheel chair… etc. I think my point is clear. Bullying anyone who fears something, legitimately or not does not deserve your pious judgement. For now, I can sleep at night knowing that all this technology is likely not killing me (that I know of…) and yes, I am an expert on the subject. if you cannot see the audio thing above, click here for the mp3.